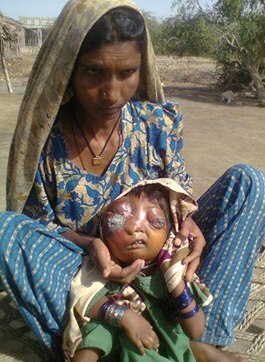 Five years old Gulshan solnagi (with her mother in pic) resident of Hur colony Khipro, District Sanghar, a desert area, is suffering from this disease in which her eyes have swollen. Few local philanthropists, took her to local hospital where doctors suspect it cancer. According to reports received through a local Khipro based journalist, Gulshan need blood bottles which are being arranged by them because Gulshan’s father a laborer, now a psycho-patient due to health of her daughter. Lack of financial resources and timely treatment has led Gulshan to this stage. Through some sources, it is learned, Minister health, Sagir Ahmed Shaikh has taken notice and directed Distirct Health Officer Sanghar for bringing her to Karachi for treatment. However, when RightsNow Pakistan’s correspondent contacted a local TV correspondent, Mohummad Ali Bozdar, who shared that Gulshan was already been to Karachi where she did not get proper attention and care at Jinnah Hospital so was brought back to Khipro. She can only be treated at Shoukat Khanam Hospital, Lahore for which her family need support. RightsNow Pakistan contacted Dr. Taj Mohummad at National Institute of Child Health who is making efforts. Besides, civil society has also made efforts for Gulshan’s treatment and Shoukat Khanam is being contacted. RightsNow Pakistan request Sindh/Federal Government for immediate intervention for saving Gulshan’s life and reducing her pain and suffering. If any individual/organization intend to support Gulshan, they can be linked with them.